This scholarship is available to any major at the college. Students may receive a scholarship of up to $16,000 (up to $4,000 per academic year) for participating in music ensembles throughout their college career. Click on the link below to apply for the scholarship online. If you have any questions, please contact Dr. Jeremy Craycraft by emailing jcraycra@css.edu. Sunday, April 7, 2019. Mid to late afternoon times available after CSS Open House events. Deadline: All application materials must be submitted at least two weeks prior to the audition date you wish to attend. Your specific audition time will be determined after receipt of your application. You will receive a follow-up email with specific audition times available and asked to provide your preference. The Sr. Monica Laughlin Scholarships are designed for prospective students. 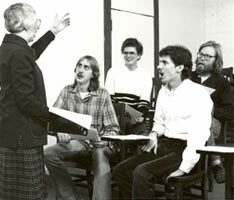 Once you arrive on campus, please know that there are Music Lesson Scholarships available for music majors and minors to pay for private lessons on a major instrument or voice. These scholarships are given in addition to other aid offered through the Financial Aid Office. If you have any questions or wish to be considered for the scholarship, please contact Dr. Jeremy Craycraft at 218-723-7021 or by email at jcraycra@css.edu.